Please use this thread for San Jose Rolling Stones 2013 show planning. Two blocks from the deAnza hotel, and a 5-10 minutes walk directly to the venue only. Britannia Arms is perfect for meeting up before the show in San Jose. I just checked it out. Great food, great draft beers and plenty of space, with the mix of a British pub and an American sports bar. See you there any time between 5pm and 7pm show day. Edited 4 time(s). Last edit at 2013-05-08 01:49 by bv. Edited 1 time(s). Last edit at 2013-04-04 13:00 by gotdablouse. Scored a ticket for San Jose in the presale. $250 for front row section 201! Congrats on the score No Expectations! Can anyone give an advice regarding HOtels in San Jose and/or Oakland? As to Oakland....stay in San Francisco and take Bart to the show. GOT A TICKET FOR THIS SHOW TOO!!! I just (barely) scored a $475 ticket in section 118 to this show. I set out to attend both bay area shows for less than I paid for this ticket, but ticketmaster's servers had other plans for me. Just got two floor seats... Let it rock!! see some in the Tongue, found a Hotel and hope it works. Got two seats in section 106 and two $85 dollar tickets. Going to see what is the better option on the night and sell the other two if I can. I'm assuming there will be people outside trying to buy... hope I'm right! As posted on the ticket trader, I got a pair of $85 tickets to Oakland and am thinking of swaping my spare with someone who has a pair of $85 for San Jose. The Arna hotel in San Jose is awesome, cheap, clean and 5 minutes walk from the venue! See you there! From what I understand,the $85 tickets are non-transferrable. You show up at the arena and go right in.No chance to resell or trade them. Yep - but they were sold as a pair, so you go right in with your guest. None of my friends from Europe can make it to this show at such short notice, so I currently don't have a guère. What I'm offering is what many fans did for club shows during Licks: you come in as my guest in Oakland, I get in as your guest in San Jose. These are the best value in the house if you dont mind not seeing the video. I was side stage at both shows in Newark and it was awesome. Doing the same for Oakland and San Jose. I'm row 19 seat 1 (closest to 117) - come and say hi! Where do the bootleg tshirts sellers hang out in SJ to sell? On the way to the arena from downtown, especially under the highway. Help anyone...I'm off to San Jose show, can someone tell me are there any stores that sell Stones shirts, etc. thanks BV! Its my first trip to this city, so looking forward to it though I won't be there long, I'm making a holiday out of this show going up the coast to Oregon and Seattle. What a nice time to take a trip & to see my fave band. Edited 1 time(s). Last edit at 2013-04-12 07:00 by daytime. HI! This my first time posting on IORR but have lurked for years. I can't wait for the San Jose show! I'm from Santa Cruz so the HP show is close to home. 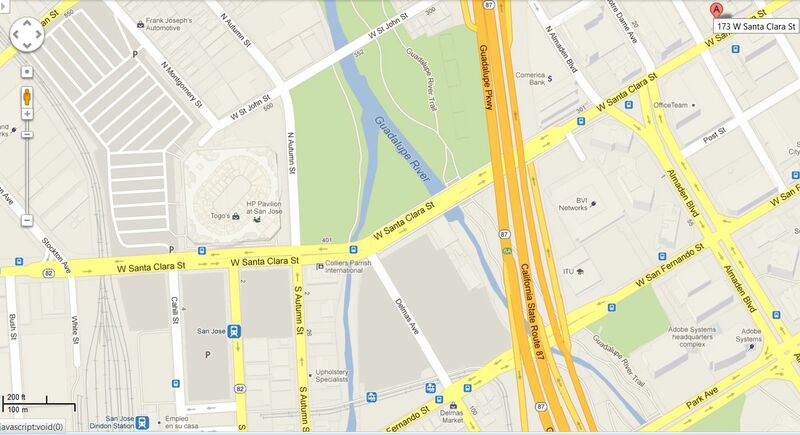 Daytime: I don't know where you are staying in San Jose but there is a huge mall called Valley Fair in San Jose. Stores that usually have Stones shirts are: Forever 21, H & M and Hot Topic. Kohl's had a bunch of 50th anniversary t-shirts but I don't know where one is in San Jose. The best shirts will be at the show but they will be more $$$. Good luck. Thanks for the info, how far is the VAlley Fair mall from the pavillion? Edited 1 time(s). Last edit at 2013-04-13 09:23 by daytime. i'm looking to stay a few nights in Santa Cruz after the show. Any recommendations? Google Maps says 3.7 miles and 11 minutes from the HP Pavilion. Plan on traffic though. It's a HUGE mall and way too much for me but you could find Stones shirts there. Have you looked on-line? That might be easier. What are you looking to do while here? I'm sure you know downtown Santa Cruz is lots of fun with good restaurants but we do have some crime and druggie issues. Just be aware of that. It's hard to see one's own town from a visitors perspective, but we have great beaches and the redwoods if you want to check out some nature. The Catalyst and Moe's Alley are the main music venues, but it's hit or miss if someone good is playing. You can also check out Capitola and Aptos which are just a few miles south and are more relaxing and less crowded. A lot of visitors and locals Love the Shadowbrook Restaurant in Capitola. It's very romantic if you are coming with your spouse, you might feel weird eating there alone in other words, Any other questions feel free to ask. I'm flying in for the San Jose show and wanted to spend a few days at the beach after. It's my wifes first time in Cali so I wanted to give her a taste of the scene, Santa Cruz seemed like a good spot. I'm not going to have a car so I needed someplace accessible by public transport, near the beach, reasonably priced and clean. Are there any pubs near the concert venue?